"A whaler and other vessels in a light breeze," John Askew, 1788, National Maritime Museum. Whaling became a juggernaut industry in the 19th century. In the period of my study, it is an important a lucrative business, but not yet the cultural and economic force it would become. This is partly evidenced by the fact that this is the first image I have examined that explicitly depicts whalers. What first caught my attention on this piece was the ensign flying from the stern of the whaler herself. 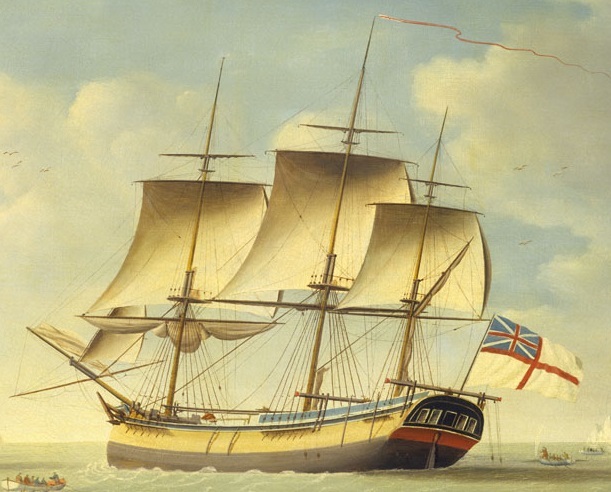 Merchant vessels, including one of the other ships in this very painting, flew the red ensign. It is much the same as the flag we see above, but instead of the white field intersected by St. George's Cross, it was a pure red field with the King's Colors as a canton. The red ensign could also be flown by British naval vessels, as could the white ensign shown above, and a blue ensign. 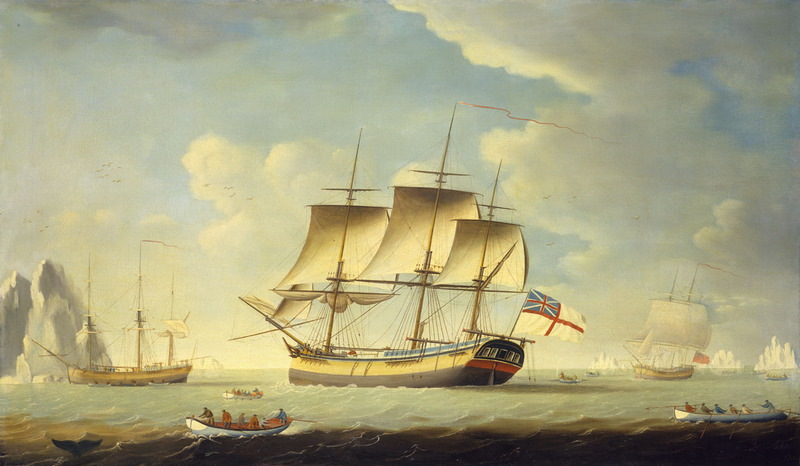 These three flags divided Royal Navy vessels into three fleets, and a white or blue ensign was a strong sign of a naval vessel, not a merchant. Clearly we are looking at a whaler. Her bulwarks are not pierced for a single cannon, and the rails running larboard to starboard are distinctive to whalers (they were meant to hold the whale boats when not pursuing their prey). The common answer to flying a "wrong" ensign is that it could be used to confuse an enemy. If this were the case, her whaleboats would be aboard, not out hunting whales while some hungry privateer closed on her. Another possible answer is that the artist knew little of the sea and merely painted ensigns he recognized. As one of Askew's earlier works, this is possible, but he was a marine artist and appears to have known what he was doing. I don't have an answer for this particular ensign being used, and suspect it may not have been as strange to the people of the past as it is to me. Perhaps vessels in the British merchant fleet did not think much about which particular ensign they used, as the most important aspect of it was to identify the nationality of your ship. 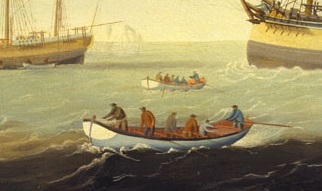 Askew depicts whalers at work in their boats, chasing the fluke of a tail. Our intrepid whalemen are clad in blue, brown, and red jacket. They wear black cocked hats and brown, grey, and blue breeches and trousers.